Yellow diamonds sell for about $4,500 per karat, depending on the cut and the color saturation. Scientists in Siberia are looking for the giant source of rare yellow diamonds, which they believe will help decipher the composition and evolution of the Earth's deep-lying layers that are currently impossible to reach by other methods. What are the origins of yellow diamonds? This question has perplexed Siberian scientists for many years. Such diamonds are very rare; South Africa and Yakutia, one of Russia's coldest regions, are the two places where they are found. Researchers believe that yellow diamonds originate from traces of organic substances once found on the Earth's surface as part of a primordial oceanic platform. Yellow diamonds sell for about $4,500 per karat, depending on the cut and the color saturation. Some particularly yellow examples are known to have sold for hundreds of thousands of dollars per karat at Sotheby’s and Christies. Yellow diamonds are of no less interesting to scientists than to collectors because they help researchers to determine the composition and structure of the deepest layers of our planet. These stones give us a better understanding of many processes taking place in the Earth's mantle, including those that result in the formation of diamond-bearing deposits. The yellow tint of these rare diamonds is explained by the presence of isolated nitrogen atoms, or so-called nitrogen defects. This means that prior to being pushed to the surface, a yellow diamond spent a very short period of time, by geological standards, in an extremely cold environment inside the mantle. Scientists scrutinized the crystals available in order to get an idea of the environment in which they were formed, and in which part of the mantle. They study the defects and imperfections, as well as the isotopic composition of carbon in the diamonds. 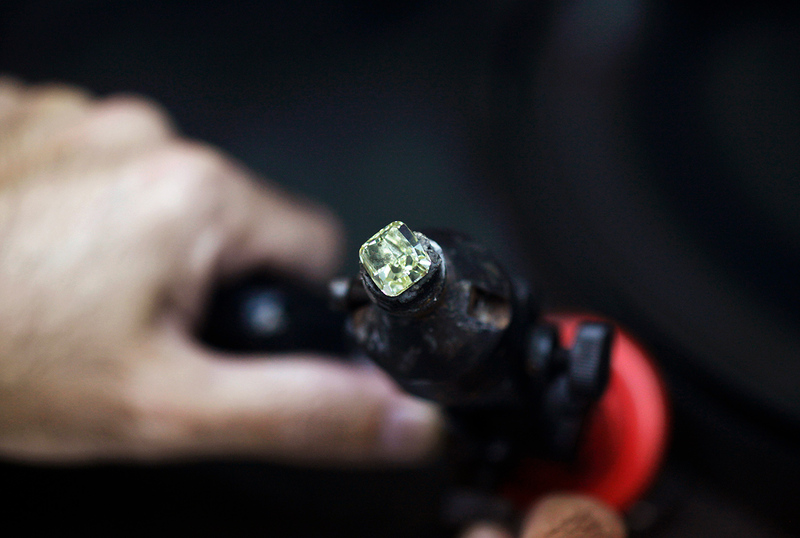 Mining companies have joined scientists in their search for a primary deposit of yellow diamonds. One of these is ALROSA (in Russian), Russia’s leading diamond producer, which has mines in the north of Yakutia. Research points to an organic source of yellow diamonds. In other words, these stones were formed from living organisms once inhabiting an ancient oceanic platform that subsequently collided with a continent and was submerged into the Earth. The high temperatures and pressures at around 100 to 150 miles deep transformed the organic remnants, and these may have crystallized into diamonds.